Task Force 1, the world’s first nuclear-powered task force. USS Enterprise (CVAN-65), USS Long Beach (CGN-9) and USS Bainbridge (DLGN-25) in formation in the Mediterranean, 18 June 1964. 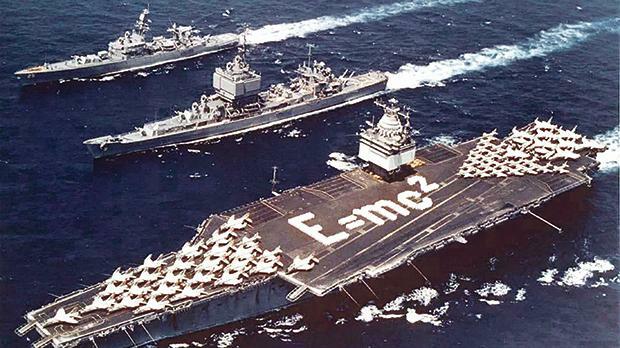 Enterprise has Einstein’s mass–energy equivalence formula E=mc² spelled out on its flight deck. Note the distinctive phased array radars in the superstructures of Enterprise and Long Beach. The three ships took part in operation ‘Sea Orbit’, an around-the-world cruise of the United States Navy’s Task Force 1. This all-nuclear-powered unit journeyed 30,565 miles un-refuelled around the world for 65 days.